The Biggest Announcement in ChurchSpring History! Today, we are thrilled to make one of the biggest announcements in ChurchSpring history. When Mike and I started ChurchSpring, we had the desire to equip Kingdom builders by leveling the church technology playing field. There was a wide chasm between modern day ministry tools and the small to mid-sized churches who so desperately needed them, but couldn’t actually afford them. For far too long, cutting-edge technology has been out of the grasp of many small to mid-sized local churches. Today, this is all about to change. Today, we are thrilled to offer the innovative ChurchSpring church website platform at a rate small and medium sized churches can actually afford. We are thrilled to offer three distinct plans to assist in growing the local church. These three plans offer a good, better, best option with a monthly plan or an annual plan at a discounted rate. In addition, you can upgrade, downgrade, or cancel at any time. The best part of each plan? There is absolutely no setup fee. You can launch your new mobile-optimized church website in just 90 seconds flat. In addition, ministries that sign up before the end of September will receive an additional 20% discount for the lifetime of their account by entering PLANS during checkout. All plans offer search engine optimization, linkable homepage sliders, clean search engine friendly URLs, drag and drop navigation menu control, and integration with your favorite social media platforms including Facebook, Twitter, Instagram, YouTube, and more. Let’s dive into a few details of each plan. The Sprout Plan offers the power of a dynamic ministry outreach tool at the price a church plant or a small thriving ministry can afford. The Sprout Plan offers mobile-friendly designs, unlimited pages, unlimited single and recurring events, and access to the entire ChurchSpring website design gallery, in addition to ChurchSpring’s very own Easy Editor. The Easy Editor offers the most intuitive, frustration-free way to update and maintain your church website. 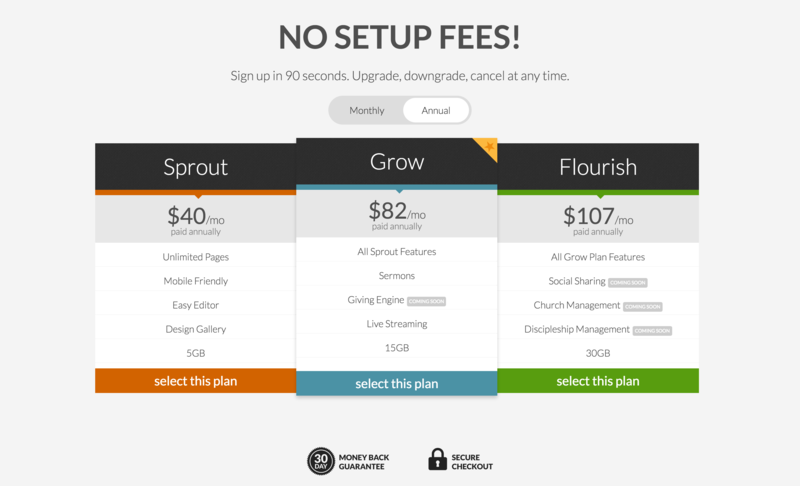 The Sprout Plan also includes 5GB of file storage for all your custom graphics. Our second option is the Grow Plan. The Grow Plan includes all Sprout Plan options plus several powerful features required for growing ministries. The Grow Plan features integrated Sermon Audio, Live Streaming, and a Giving Engine that will be coming soon! The Grow Plan offers 15GB of integrated file storage to handle your custom graphics and sermon audio hosting needs. The Flourish Plan is our top plan. The Flourish Plan includes all Grow Plan options in addition to several upcoming features that include Social Media Scheduling, Church Management, and our One to One Discipleship Management platform. The Flourish Plan goes beyond the features of an optimized church website and establishes an integrated discipleship platform for your entire ministry. We're pleased to offer our introductory ChurchSpring plans at these low annual rates. The Sprout Plan starts at $40/mo. The Grow Plan starts at $82/mo. The Flourish Plan starts at $107/mo. In addition to these low monthly plans, we are pleased to offer a 20% off lifetime discount for ministries that sign up by 9/30/2016! Use coupon code PLANS during checkout to receive 20% off your entire plan for life! That’s right! You will receive 20% off your monthly subscription for the lifetime of your account. New customers that sign up at these low introductory rates will lock in this rate for the lifetime of your account. Simply put, your monthly subscription fee will never increase during the lifetime of your account. All plans come with a no-risk 30 day money back guarantee. If you’re not satisfied with your ChurchSpring website for any reason, simply cancel your service within 30 days of setup to receive a full, hassle-free refund. The playing field has been leveled. Now, small and mid-sized churches can leverage cutting-edge church technology that historically only the mega church could afford. Don’t miss out on this introductory offer! Use coupon code PLANS during checkout to receive 20% off your church website for life! Don’t wait, sign up today! Rohn is committed to the Lord and doing His work. He has dedicated his life to Christ and spreading the truth of God’s love. Rohn has served as an executive at several large ministry and faith-based organizations and has been blessed to impact the lives of hundreds of thousands of families around the world. My site looks really sweet and has been very easy to edit. Thus far I think it might be the easiest-to-use as well as most-responsive website creator I've tried. ChurchSpring is by far the easiest church website management system I have ever used. Thank you for providing such an incredible service. ChurchSpring is a discipleship company committed to growing the local church and building the body of Christ. ChurchSpring offers the most intuitive, affordable, frustration-free church websites on the planet. Learn more. The theme you've chosen is not compatible with your selected plan. You can either change the theme or upgrade your plan. The plan you've chosen is not compatible with your selected theme. You can either choose an upgraded plan or change your theme. Effective as from 23 Februrary 2014. ChurchSpring reserves the right to update the Website and these Terms of Service from time to time, at our discretion and without notice. Nevertheless, this document is public on ChurchSpring, and you will be able to track the changes for any new version. Your continued use of the Website following the publishing of updated Terms of Service means that you accept and agree to the changes. If you agree to pay the fee for access to the applicable ChurchSpring Service, such fee will be charged by the company designated by ChurchSpring in accordance with the payment method you have chosen for your purchase. If you are paying by credit or debit card, by designating a card to be billed, you confirm that you are authorized to make such purchase and that you are the holder of such card (i.e. that the card is issued in your name). All prices stated on the ChurchSpring Websites are inclusive of any applicable sales taxes and fees. ChurchSpring accepts a variety of different payment methods, so please check the ChurchSpring Websites for the best way for you to pay. ChurchSpring may change the price for the ChurchSpring Paid Service from time to time. In respect of the ChurchSpring Paid Service, such changed price will take effect after the expiry of the then current paid for period (i.e. the term that you have already paid for). Any price change will be communicated to you at least 14 days in advance so that you have an opportunity to elect to not renew. If you do not wish to be bound by such changed price relating to your ChurchSpring Paid Service you may terminate your subscription of your ChurchSpring Paid Service in accordance with Section 8 (Term and termination). Your continued use of the ChurchSpring Paid Service after the communication of such price change to you constitutes an acceptance of such new price. Your subscription to the ChurchSpring Paid Service will automatically renew at the end of each subscription term unless you terminate your subscription prior to the end of such subscription term in accordance with Section 8 (Term and termination). Such renewal will always be for a monthly subscription term, even if the previous subscription term was for a longer period. At the time of renewal the payment method you have designated to be charged for the purchase of the ChurchSpring Paid Service will automatically be charged our then current fees for the applicable subscription. Your use of ChurchSpring is at your sole risk. The service is provided "as is" and "as available". We disclaim all warranties of any kind, express or implied, including, without limitation, the warranties of merchantability, fitness for a particular purpose and non-infringement. We are not liable for damages, direct or consequential, resulting from your use of the Website, and you agree to defend, indemnify and hold us harmless from any claims, losses, liability costs and expenses (including but not limited to attorney's fees) arising from your violation of any third-party's rights. You acknowledge that you have only a limited, non-exclusive, nontransferable license to use the Website. Because the Website is not error or bug free, you agree that you will use it carefully and avoid using it ways which might result in any loss of your or any third party's property or information. This Agreement will become effective in relation to you when you create a ChurchSpring account or when you start using the ChurchSpring Service and will remain effective until terminated by you or ChurchSpring. You may cancel your subscription of the ChurchSpring Paid Service at any time by visiting your subscription page which termination shall have effect at the expiry of the then-current subscription period that you have already paid for (e.g. one month, one quarter or a year). ChurchSpring will not refund any remaining portion of subscription fees you have already paid for. ChurchSpring reserves the right to terminate this Agreement or suspend your ChurchSpring account at any time in case of unauthorized, or suspected unauthorized use of the ChurchSpring Service whether in contravention of this Agreement or otherwise. If ChurchSpring terminates this Agreement, or suspends your ChurchSpring account for any of the reasons set out in this section, ChurchSpring shall have no liability or responsibility to you, and ChurchSpring will not refund any amounts that you have previously paid. ChurchSpring respects intellectual property rights, and expects you to do the same. The ChurchSpring Service and the content provided through the ChurchSpring Service is the property of ChurchSpring or ChurchSpring's licensors and protected by intellectual property rights (including but not limited to copyright), and you do not have a right to use the ChurchSpring Service (including but not limited to its content) in any manner not covered by the Agreement. Furthermore, you must not infringe any third party's intellectual property rights in using the ChurchSpring Service. Further, you may not remove or alter any copyright, trademark or other intellectual property notices contained on or provided through the ChurchSpring Service. If you are a copyright holder who believes that any of the products, services or content which are directly available via the ChurchSpring Websites are infringing copies of your work, please let us know. Pursuant to The Digital Millennium Copyright Act, 17 United States Code 512(c)(3), a notice of alleged copyright infringement should be sent to ChurchSpring's designated copyright agent at the following address: ChurchSpring Attn: Legal Department, Copyright Agent 106 S. Carroll St. Rock Rapids, Iowa 51246 legal@churchspring.com A notification of claimed copyright infringement must be addressed to ChurchSpring's copyright agent listed above and include the following: A physical or electronic signature of the owner (or person authorized to act on behalf of the owner) of the copyright that is allegedly infringed; Specific identification of each copyrighted work claimed to have been infringed; A description of where the material believed to be infringed is located on ChurchSpring Service or the ChurchSpring Websites (please be as detailed as possible and provide a URL to help us locate the material you are reporting); Contact information for the complaining party, such as a complete name, address, telephone number, and email address; A statement that the complaining party has a good faith belief that use of the work(s) in the manner complained of is not authorized by the copyright owner, its agent, or the law; and A statement that the information in the notification is accurate, and under penalty of perjury, that the complaining party is authorized to act on behalf of the owner of an exclusive right that is allegedly infringed. ChurchSpring will make reasonable efforts to keep the ChurchSpring Service operational. However, certain technical difficulties or maintenance may, from time to time, result in temporary interruptions. ChurchSpring reserves the right at any time and from time to time to modify or discontinue, temporarily or permanently, functions and features of the ChurchSpring Service with or without notice. ChurchSpring may assign this Agreement or any part of it without restrictions. You may not assign this Agreement or any part of it to any third party. Should for any reason or to any extent any provision of this Agreement be held invalid or unenforceable, such invalidity or enforceability shall not in any manner affect or render invalid or unenforceable the remaining provisions of this Agreement and the application of that provision shall be enforced to the extent permitted by law. i. You and ChurchSpring agree that any dispute, claim or controversy arising out of or relating in any way to the ChurchSpring Service or your use thereof, including our Agreement, shall be determined by mandatory binding arbitration. You agree that the U.S. Federal Arbitration Act governs the interpretation and enforcement of this provision, and that you and ChurchSpring are each waiving the right to a trial by jury and the right to participate in a class or multi-party action. This arbitration provision shall survive termination of this Agreement and the termination of your ChurchSpring subscription. The arbitration will be governed by the Commercial Arbitration Rules and the Supplementary Procedures for Consumer Related Disputes of the American Arbitration Association (the "AAA Rules"), as modified by this Agreement, and as administered by the AAA. ii. You and ChurchSpring agree that (a) any claims seeking to enforce, protect, or determine the validity or ownership of any intellectual property rights, and (b) any claims related to allegations of theft, piracy or unauthorized use of the ChurchSpring Service are NOT subject to mandatory arbitration. Instead, you and ChurchSpring agree that the preceding claims (including but not limited to claims for injunctive or equitable relief) shall be exclusively decided by Courts of competent jurisdiction in Rock Rapids, Iowa, and that applicable Iowa and/or Federal law shall govern, without regarding to choice of law principals. iii. YOU AND CHURCHSPRING AGREE THAT EACH MAY BRING CLAIMS AGAINST THE OTHER ONLY IN YOUR OR ITS INDIVIDUAL CAPACITY, AND NOT AS A CLASS MEMBER OR IN ANY REPRESENTATIVE CAPACITY OR PROCEEDING. Further, the arbitrator shall not consolidate any other person's claims with your claims, and may not otherwise preside over any form of a multi-party or class proceeding. If this specific provision is found to be unenforceable in any way, then the entirety of this arbitration section shall be null and void. The arbitrator may not award declaratory or injunctive relief. iv. Any arbitration must be commenced by filing a demand for arbitration with the AAA within ONE (1) YEAR after the date the party asserting the claim first knows or reasonably should know of the act, omission or default giving rise to the claim; and there shall be no right to any remedy for any claim not asserted within that time period. If applicable law prohibits a one-year limitations period for asserting claims, any claim must be asserted within the shortest time period permitted by applicable law. Your arbitration fees and your share of arbitrator compensation will be limited to those fees set forth in the AAA's Consumer Rules with the remainder paid by ChurchSpring. Any arbitration costs or fees deemed "excessive" will be paid by ChurchSpring. v. You and ChurchSpring agree that this Agreement involves interstate commerce and is subject to the Federal Arbitration Act. You and ChurchSpring further agree that applicable laws of the State of Iowa shall exclusively govern any dispute without regard to choice or conflicts of law rules. The sole and exclusive venue for the resolution of any dispute, whether or not subject to mandatory arbitration as described above, shall lie in Rock Rapids, Iowa. In the event that this Agreement is translated into other languages and there is a discrepancy between the two language versions, the English language version shall prevail to the extent that such discrepancy is the result of an error in translation. Copyright © 2014 ChurchSpring and its affiliates. All rights reserved. We believe in one, and only one, living and true God. He is the sovereign Creator, Sustainer, Redeemer, and Ruler of all things. He is infinitely perfect and eternally reveals Himself as the Father, Son, and Holy Spirit, with distinct personal attributes, yet without division of nature, essence or being. To Him be all honor, glory, and praise forever! The Father eternally reigns with providential care over all life and history, according to the purpose of His grace. He is all powerful, all knowing, all loving, and all wise. God is Father to those who become His children through faith in the Lord Jesus Christ. Jesus Christ is the eternal Son of God. In His incarnation, Jesus was miraculously conceived by the Holy Spirit and born of the Virgin Mary. Being fully God and fully man, He perfectly carried out the will of God, identifying Himself completely with mankind yet without sin. He provided salvation through His atoning death in our place and by His bodily resurrection. On the third day, He ascended into heaven and is now exalted at the right hand of God where He intercedes for all believers and dwells in them as their ever-present Lord. He will return in power and glory to judge the world and consummate His redemptive mission. The Holy Spirit, the third person of the Godhead, has come to glorify Christ, apply His saving work to our hearts, and seal us for the day of redemption. He convicts individuals of their sinfulness and of the righteousness of Christ, draws them to the Savior, and bears witness to their new birth. Indwelling each believer, He empowers, guides, teaches, fills, sanctifies, and produces the fruit of Christlikeness in all who yield to Him, to the glory of the Father. He leads each believer to glorify God by exalting Christ, equipping believers and evangelizing sinners. We believe that man is the special creation of God, made in His own image to have fellowship with Himself and to be steward over His creation. He created them male and female as the crowning work of His creation. Through the temptation of Satan, Adam chose to disobey God, fell from his original innocence which this brought sin and death to the human race and suffering to all creation. Therefore, everyone is born with a sinful nature, under the condemnation of their sin, and in need of being reconciled to God. Throughout the Bible, God defines marriage as a covenant between one man and one woman (Genesis 2:24, Matthew 19:2-9). This framework is the only means in which a man and a woman should experience intimate companionship and procreation. The New Testament uses this definition of marriage as a way of describing the union of Christ and the Church. The Bible calls Jesus the “Bridegroom” and the Church his “Bride” (John 3:29). Any alterations of this definition of marriage are unnatural, dishonoring, and unfruitful perversions of God’s intended design for marriage. God’s mandate to Adam and Eve was to be fruitful and multiply in order that the earth would be filled with the praise of his glorious image. But Adam and Eve disobeyed God in the garden and the result of their sin was a distortion of that image. They no longer reflected the light of life, love, faithfulness and purity of God. They now reflected the darkness of death, destruction, and impurities of selfish ambition. Since God, who is light, cannot fellowship with darkness, he cast them out of the garden (Genesis 3:23-24, 2 Corinthians 6:14). This was the just penalty for their sin. Not only was it a physical separation from God, but physical death entered the picture as well. And their physical death and separation were an outward display of the their spiritual death and separation from God. Now that the image of God had been marred, Adam and Eve were only capable of multiplying an impure image. Through their physical multiplication, all of mankind is now born into sin. “Therefore, just as sin came into the world through one man, and death through sin, and so death spread to all men because all sinned. The earth is now filled with a people that are desperately wicked and spiritually dead in their sins. They are separated from God, and at the point of their physical death, that separation becomes eternal. We believe that salvation is a free gift of God, by His grace, that is to be received through personal faith in the Lord Jesus Christ, apart from our work. There is no salvation apart from faith in Jesus Christ. Through faith in Christ, a believer is justified and brought into a new relationship of peace with God. We believe the true Church is comprised of all persons who, through saving faith in Jesus Christ and the sanctifying work of the Holy Spirit, are united together in the body of Christ. The Church finds her visible expression in local congregations where the Word of God is preached in its purity and the sacraments (or ordinances) are administered in their integrity; where scriptural discipline is practiced, and where loving fellowship is maintained. For her perfecting, the Church awaits the return of her Lord. We believe Jesus Christ will come again to the earth— personally, visibly, and bodily—to judge the living and the dead and to consummate history and the eternal plan of God. “Even so, come, Lord Jesus” (Rev. 22:20). Signup for a chance to win a FREE church website for life! You read that right! We will be "casting lots" for one church to receive a FREE website for life! We don't like SPAM and promise to keep your email address safe! Keep an eye on your email for the winning name! Signup to be notified when this FREE video series is live! I've already signed up for access! Keep an eye on your email and we will let you know when the FREE video series is live. In the meantime checkout our facebook group. Enter the email you signed up with to regain access. This video is not available yet. We will notify you by email when this video is live. Signup to receive this FREE social media resource! We have sent an email to you with the link to download this valuable resource. Download The Beginner’s Guide to an Effective Website by filling out the information below. Be the first to hear when we launch the new member directory! You're in the inner circle now! You'll be the first to hear when we have any developments on the new member directory feature.